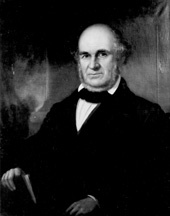 BADGER, George Edmund, a Senator from North Carolina; born in New Bern, N.C., April 17, 1795; instructed by private teachers and attended preparatory school at New Bern; attended Yale College in 1810 and 1811; studied law; admitted to the bar in 1814 and commenced practice in New Bern; member of the house of commons of North Carolina in 1816; elected judge of the superior court in 1820 and served until 1825, when he resigned; moved to Raleigh, N.C.; appointed Secretary of the Navy in the Cabinet of President William H. Harrison, March 5, 1841, reappointed by President John Tyler, and served until September 11, 1841, when he resigned to resume the practice of law; elected as a Whig to the United States Senate in 1846 to fill the vacancy caused by the resignation of William H. Haywood; reelected in 1849 and served from November 25, 1846, to March 3, 1855; not a candidate for reelection; chairman, Committee on Enrolled Bills (Thirty-first Congress); nominated by President Millard Fillmore as an Associate Justice of the Supreme Court in 1853, but was not confirmed by the Senate; returned to Raleigh and resumed the practice of law; member of the State convention in 1861; died in Raleigh, N.C., May 11, 1866; interment in Oakwood Cemetery. American National Biography; Dictionary of American Biography; London, Lawrence F. George Edmund Badger in the United States Senate, 1846-1849. North Carolina Historical Review 15 (January 1938), 1-22; London, Lawrence F. George Edmund Badger, His Last Years in the United States Senate, 1851-1855." North Carolina Historical Review 15 (July 1938): 231-50.